The all-in-one B2B e-commerce tool for your team and your customers. 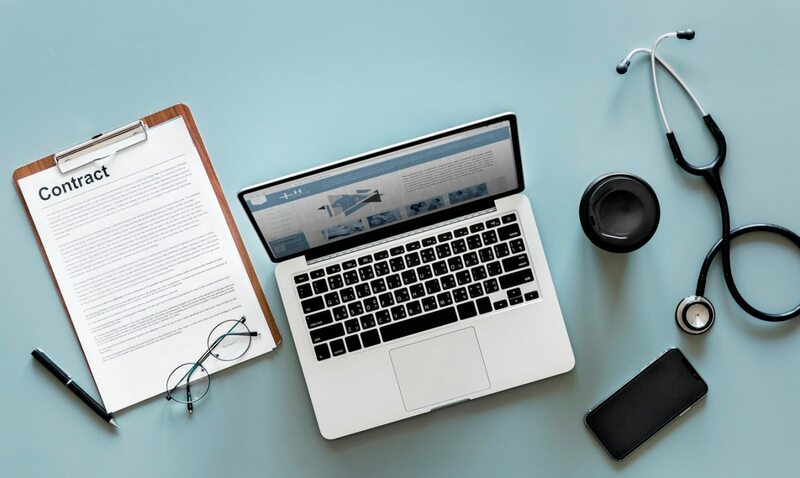 More and more smart medical and pharmaceutical wholesalers are digging into B2B ecommerce solutions – here is why their interest has sparked. According to IBISWorld research, the medical supplies market in the US alone was worth $192 billion in 2017. With B2B ecommerce growing equally as fast, smart and forward-thinking medical and pharmaceutical wholesalers will seek to converge the two growing trends – and here is why. The internet has changed how people react with technology. Especially in the last decade, it has also impacted the way consumers research and buy goods and services through ecommerce. And while B2C ecommerce is by now well-rooted into our everyday lives, what every B2B business owner must realize is that the changes in B2C have sparked changes in the B2B industry as well. In fact, this shift towards technology and innovation is so radical that Frost & Sullivan predicts B2B ecommerce will be double the size of B2C by 2020. Inevitably so, this will also affect medical and pharmaceutical supplies businesses. Should you embrace the digital trend? As a medical and pharmaceutical business you may be reluctant about moving your business online.Traditionally the medical and pharmaceutical B2B industry works through sales representatives building on personal relationships. Indeed, many sales professionals originally saw B2B ecommerce as a threat to their role as trusted advisors to their client base. Yet, 74% of B2B buyers research their purchases online and, once they take their final decision, 93% of them complete their purchase online. Hospital procurement managers and medical and pharmaceutical distributors are no different than these buyers. Even more, according to Forrester, 85% of all B2B buyer-seller relationships will be managed without human interaction by 2020. B2B ecommerce encompasses a lot more than just an online ordering system. In fact, it allows wholesalers to grow their business. How? By helping them to increase their sales, scale up their business, and improve their services. 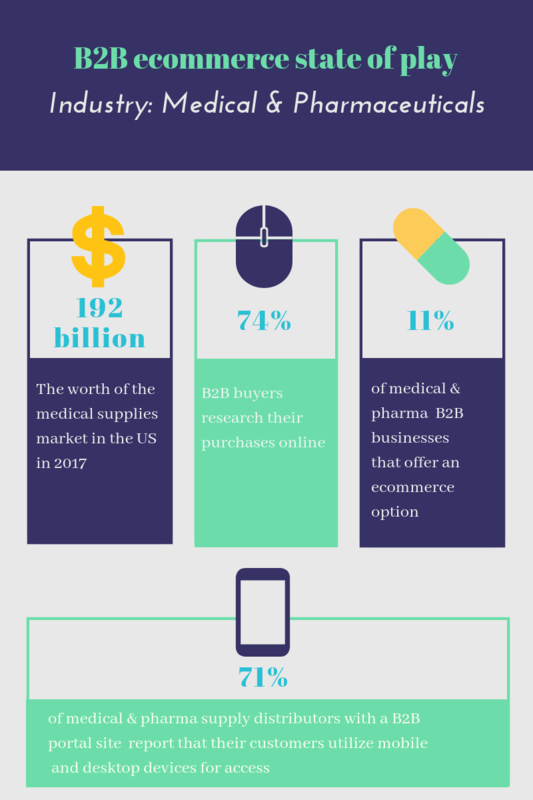 Medical and pharmaceutical B2B buyers are already buying online. Without a B2B ordering portal, you are losing out on the opportunity to tap into a large pool of potential prospect not only in your region, but worldwide. Though an ecommerce solution, you can reach more prospects and put your foot in new markets with no brick-and-mortar expenses simply making your software available in other languages. To add to this, your B2B portal is open 24/7 all year long, meaning that you can take in new orders anytime and from anywhere. A smart B2B ecommerce software allows you to harness many powerful tools and monitor your business cycle more closely and intensively. Through it you can measure your sales cycle, inventory turns, your sales reps and customer service effectiveness, your product mix, and eventually, control customer satisfaction. Also, digitizing your sales means that you can use powerful digital marketing tools (email marketing, etc.) to increase the volume of your sales and the average order value. In other words, data and analytics can help you produce better content for your customers and deliver processes to match their preferences. Moreover, a B2B ecommerce solution can help you improve the purchasing experience for existing customers. How? The ordering process becomes transparent as any customer can check on the status of their order, view past orders, quickly reorder their preferred items, browse and download your product catalog, contact your customer service at any time, and manage their account on your B2B portal at their own ease. Finally, a B2B ecommerce platform helps you create a solid and unified business process by integrating and automating your sales transactions, and streamling warehousing and logistics. In 2016, wholesalers who have begun to sell online have reported a 44% increase in their revenues. How so? A B2B ecommerce solution opens up new sales channels for B2B businesses. Tablets and mobile phones are only two them: 71% of medical supply distributors with a B2B portal site report that their customers utilize mobile and desktop devices for access. As such, opening up your online B2B store leads to scaling your business and, eventually, fuels your business’s growth. A survey by Market Dynamics reported that in over 50% of larger companies, handling the paperwork associated with the manual processing of a single sales order takes up an average of more than 51 hours. The automated selling process introduced by ecommerce software eliminates the need for extra manual work since your customers are inputting their orders themselves. In fact, according to Forrester, with an ecommerce platform processing errors are minimized and inefficiencies are ironed out to deliver cost savings of up to 90%. This also allows sales reps and customer service agents to focus on improving their services instead of merely taking and entering orders and contacting your clients. Even more, integrating your website with your ERP can decrease order errors, improve shipping and inventory processes, and simplify billing. Sign up for a free trial account on B2B Wave to get accustomed with the ecommerce universe and explore what our user-friendly wholesale ordering platform can do for your medical and pharmaceutical business.